Two women from Essex have received a reply from Sir Paul McCartney, half a century after trying to contact him. Barbara Bezant and Lyn Jeffries recorded a message to the then Beatle in 1963 and sent a tape to the London theatre where the band was playing. Decades later it turned up at a car boot sale and the women were reunited with the recording by The One Show. 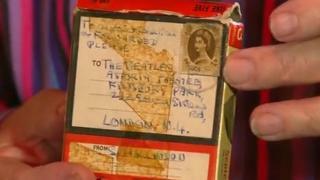 Sir Paul wrote to them to thank them for their "lovely tape" and said "better late than never". At the time of the recording, Barbara Bezant and Lyn Jeffries were 17 and 19 respectively and both lived in Eltham, south London. They saw The Beatles at the Lewisham Odeon in December 1963 and recorded their message on a reel-to-reel tape recorder before posting it to the Finsbury Park Astoria, where the band were due to play. Among other things, the message said: "This dream is just to come round the back and see you, but I don't suppose that'll ever happen. "But we can always live in hope, can't we?" The tape was bought at a car boot sale in Great Yarmouth by local historian David McDermott who listened to it. He said: "It was like sitting in a bubble and being there when these two girls were making this tape. "The hairs on the back of my neck stood up and it made me wonder if these two were still with us." The One Show reunited the pair at The Beatles Story exhibition in Liverpool and presented them with the letter from Sir Paul. It read: "Hi Linda and Barbara, thanks very much for you lovely tape. It finally got through, better late than never. "Great to hear that you found each other after all these years. "Keep enjoying the music, love Paul." The women had not seen each other for 40 years, although both were living in Essex - Barbara in Dovercourt and Lyn in Leigh on Sea. They said they were "amazed" to be reunited and to finally get a reply from a Beatle.